By Scott Gilfoid: Amir Khan (29-3, 19 KOs) believes that it really doesn’t matter who his next opponent is for his December 6th fight. He still thinks he’ll get the Mayweather fight next year regardless of who his adviser Al Haymon and his promoters at Golden Boy Promotions pick out for him to fight in December. Khan has mentioned over and over again that his management have three opponents – Robert Guerrero, Devon Alexander and Josesito Lopez – that they’re looking at for his next fight. The guy that is repeatedly mentioned as the fighter that they want Khan to fight is Josesito Lopez, a fighter who has lost 3 out of his last 7 fights. “Whoever it is in December, I think it’s still going to lead to a fight with Floyd because there’s so much talk about it. Plus, I think Floyd needs somebody to get them [pay-per-view] numbers high,” Khan said to Fighthype.com. If it doesn’t matter who Khan fights then why should Mayweather bother fighting him? If it’s only about fighting whoever then Mayweather can always find that type of opponent pretty much anywhere in the division, because there’s plenty of fighters that are taking on nothing but soft jobs 24/7 without facing the best. For a guy to fight Mayweather, they should be looking to fight the best instead of thinking that it doesn’t matter who they face. I believe it does matter. That’s why Mayweather opted not to fight Khan the last time, because he hadn’t been fighting the guys that he needed to in order to earn a fight against him. Marcos Maidana did fight the right guys in beating Adrien Broner and Jesus Soto Karass. In Khan’s case, he’s beaten a fighter named Carlos Molina, Julio Diaz and Luis Collazo in his last three fights. Those aren’t big names if you’re looking for a fight against Mayweather. If Khan takes on another soft job in his next fight in December, I think it’s going to mess him up permanently for a Mayweather fight. 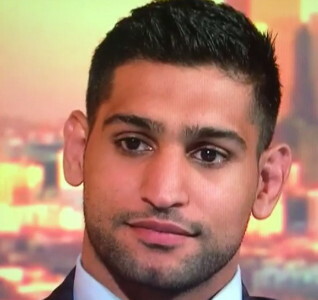 We’re really talking about the May fight being Khan’s last chance to fight Mayweather, because Khan can’t fight him next year in September because Khan has Ramadan during that time. As such, it’s May of next year or not at all. That’s why Khan’s fight in December is so important. He needs to show boxing fans that he can still face the best because he stopped doing that after he was whipped by Danny Garcia in 2012. It’s been nothing but tune-up bouts ever since that fight for Khan. A fight against Josesito Lopez is a step down from Collazo, a fighter that was a name back in 2007, but who hasn’t done anything since then after losing his WBA strap to Ricky Hatton.